Love the smell of homemade bread? This whole wheat english muffin recipe is a fabulous breakfast or lunch option, one that’s surprisingly easy to prepare. Homemade english muffins have much more flavor than anything you’ll buy at the store, as well as a satisfying, crunchy exterior. I don’t typically use a lot of bread products. I’m not exactly a low carb gal, but bread has always been a slippery slope for me. Regardless of whether it’s a fresh artisan loaf from the local bakery or pre-sliced potato bread from the grocery store, if there’s bread around, I find myself eating more of it than I should. There are two exceptions to this: sprouted ezekiel bread and english muffins. For whatever reason, I don’t feel compelled to binge on either of these. When I have some extra time, I especially love making english muffins from scratch. I enjoy making both regular and whole wheat english muffins. The whole wheat version has an added earthiness that I find irresistible with egg sandwiches, for some reason. There’s just more flavor happening. I don’t use all whole wheat here, and I don’t recommend it. The results are too dense and dry. Using a mix of all-purpose and whole wheat flour gives me exactly the results I’m seeking. Cooking these english muffins in a skillet before baking them creates the traditional nook and cranny appearance we’re all used to, but their texture is slightly more dense than supermarket counterparts. Feel free to play around with the ratio of whole wheat to all-purpose flour. At some point soon I plan to try creating a version of these that uses my sourdough starter instead of yeast. I think that will add even more flavor and lightness. If you’re looking for some other homemade bread ideas, you should check out my cheddar brioche buns and my buttery sourdough buns! 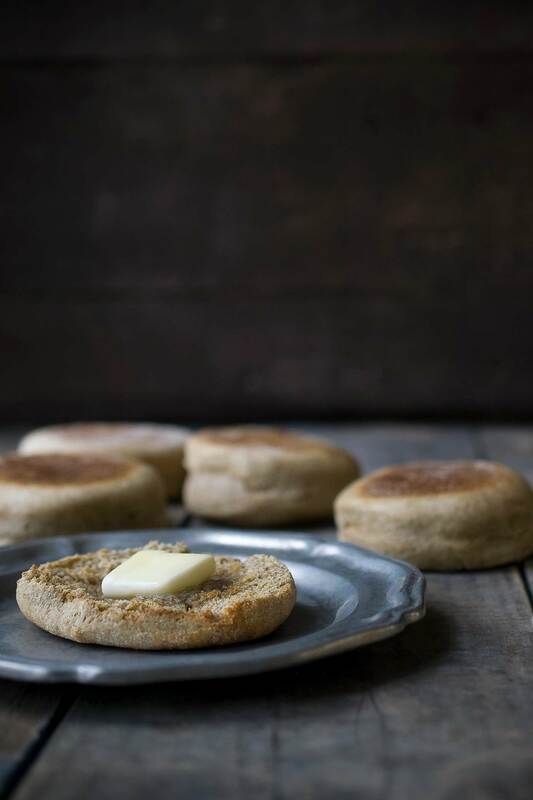 These whole wheat english muffins are a surprisingly easy breakfast option! Making english muffins from scratch is super satisfying! Whisk together the flours, salt, sugar, baking soda and yeast. In a small saucepan, warm the milk and butter over medium heat until the butter has just melted. Let the milk cool for several minutes until it's lukewarm. In a stand mixer with the dough attachment, combine the milk and butter with the egg and dry ingredients and mix until the dough comes together. Allow it to mix on medium speed for an additional minute. This can also be accomplished without a stand mixer, by combining the ingredients in a bowl and then kneading the dough briefly. Turn the dough out onto a lightly floured surface. Roll out to approximately 3/4-inch thickness (they will puff up while cooking). Use a round cutter (approximately 3 3/4 inches) to cut the english muffins, re-rolling the dough as needed. Place the cut dough on a baking sheet dusted with semolina flour or cornmeal. Cover the baking sheet with a towel and allow the dough to rest for a minimum of 20 minutes, up to 90 minutes. Before serving, fork split and toast the english muffins. These will keep for up to 2 weeks in an airtight container at room temperature, or for several months in the freezer. You can certainly use only whole wheat flour, but I don't really recommend it because the texture becomes much more dry. This balance of flour offers a perfect, earthy, whole wheat flavor. Don't expect the texture and flavor of these to be identical to store-bought English muffins. Those have weird ingredients and preservatives. These are slightly more dense with fewer nooks and crannies, but are much more flavorful. « What Does It Mean When Garlic Sprouts? I made these today and loved them! I used non fat milk (already had it) and subbed honey for the sugar. They were wonderful! Your recipe was great. They rose more than I expected for being half Whole Wheat. They were a big hit at my house. Hi Jennifer, These muffins look beautiful and this is a great recipe if you’re pressed for time. I’ve tried several recipes for English muffins and the sourdough ones are my favorite. I don’t add any yeast to the dough when using my starter. The rise time is longer, but the flavor develops more deeply and the texture has a bit of “chew” to it. 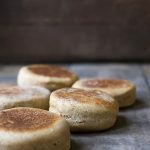 Absolutely love your wheat english muffins recipe! Definitely i’ll try your recipe but instead of 1 tablespoon granulated sugar i use 1 tablespoon of honey and it would be perfect! Thanks for sharing! glad to have this recipe from scratch since I use whole wheat muffins every day with store bought muffins, thank you! These were amazing. They didn’t have as much of the “nooks and crannies” as we wanted, but this was my first shot at English muffins. I’m not sure if didn’t do it quite right, or if that’s what you get for using whole wheat. They were still very delicious and very similar to English muffins. I will certainly make this recipe again. Disappointed. I really wanted to love this but the final product was tasteless, doughy and leaden. My radar went up with the 20-minute rise time. Even with instant yeast I knew this was much too short a time. The low heat in the skillet did nothing to the muffins … raised it to medium to get the color and crust. This recipe does not work. Hi Becky! I’m so sorry you didn’t like the recipe, but it definitely works. I’m not quite sure what happened, but if you read through the comments, a LOT of people have made them and love them. I’ve made this many times myself, and they’re a staple around here. But I appreciate all feedback, whether positive or negative. So thanks for taking the time to comment. Hi, Jennifer! I’ve made these muffins today and they are delicious! Thanks for the recipe! But I’ve had a little problem – when I put the muffins in the oven, they began to rise and just split on one side. Do you have any idea what might be the reason? Hmmm. Do you mean they only rose on one side, or that they rose evenly and then one side split? If you look closely in the background of my first photo, you can see that the rise was a bit uneven on two of them (mainly the one in the center). I’ve made this recipe numerous times, but I’ll admit it has been a year or so at this point, so I’m not remembering if I ran into that regularly. If I did, it wasn’t an issue that would have prevented even toasting or anything like that. Off the top of my head, the most likely cause is if the tops aren’t perfectly flat when they go in the oven. You could try rolling them a bit thinner next time and see if that helps. Can I skip the skillet and bake these in the oven straightaway? I wouldn’t recommend this. 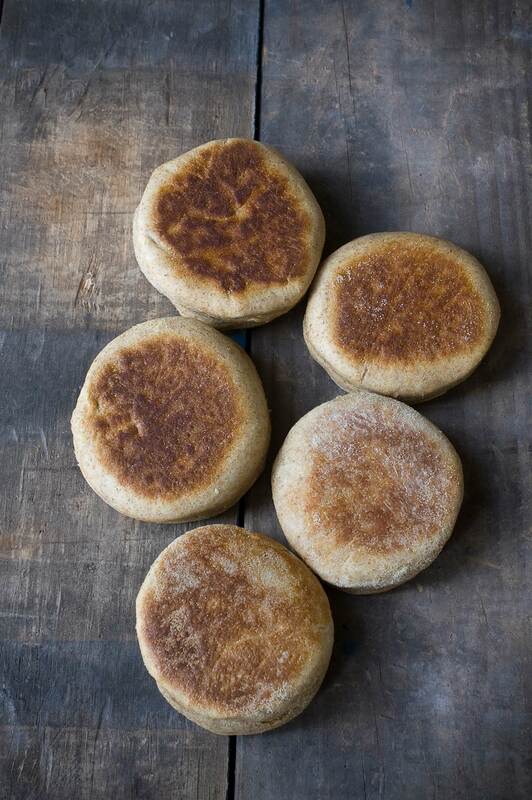 You’ll loose some of the texture that makes them English Muffins as opposed to biscuits. Can I mix them by hand? And will 1% milk work? Hi Alexa, you can mix them by hand. 1% milk will still work, but the english muffins won’t be as moist since there will be a lower fat content. Pretty freakin’ awesome. First time’s the charm. Let sit for at least 60 minutes – yeast dough likes time. I love these whole wheat english muffins! They turned out great, especially with that kosher salt. Can I substitute a dairy free milk such as Almond milk? I wouldn’t recommend using nut milk in place of whole milk. It will *technically* work in the sense that you’ll still get English muffins, but they’ll be more dry and dense since you’re losing the fat from the milk. Would lactose-free milk be an option? If you need to use a nondairy substitute, the best option is probably soy milk. It’s less creamy, but it’s the most comparable to dairy milk in terms of texture.